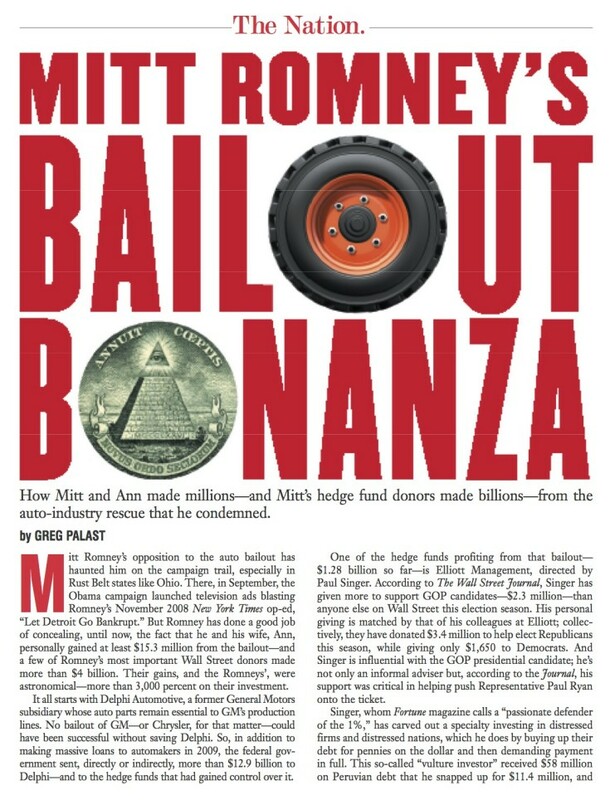 An investigative article by Greg Palast appearing in the latest The Nation magazine as its cover story brings some shocking allegations about presidential candidate Mitt Romney and the auto bailout to light. 1. 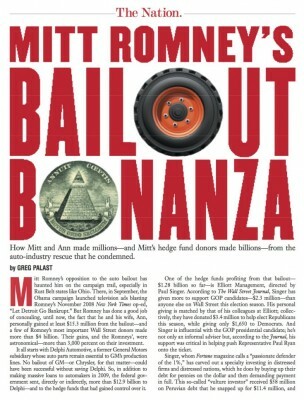 The Romneys made no less than $15.3 million (and likely much more) on the auto bail-out – a 3000% profit – all TARP government money. 2. Three of Romney’s top donors made more than $4 billion for their hedge funds on negligible investment. 3. They grabbed Delphi Corporation, the old GM Delco auto parts division, for 67 cents a share – which now sells for $30 a share, care of the US Taxpayer. 4. Romney’s vulture fund partners eliminated every single UAW job (over 25,000 workers), closed 29 plants in the USA and moved the plants to China. 5. The Romney’s billionaire partner, Paul Singer and his “vulture fund” Elliott Management, made the super profits using methods called “extortion” by insiders. 6. The Romneys big pay-day was well concealed in Ann’s “blind” trust, a suspect limited liability corporation. 7. And they’ve paid virtually no tax on the big gain – partly because the vulture funds have moved Delphi’s incorporation from Troy, Michigan, to the Isle of Jersey in the Mediterranean, a notorious tax haven. 8. Romney’s partners Singer and John Paulson gave more than one million dollars each to the Romney super-PAC Restore Our Future. The third billionaire, Dan Loeb, has also given close to a million to the GOP. Greg Palast, who holds an MBA in Finance from the University of Chicago is a racketeering investigator-turned-journalist who has tracked Romney’s “vulture” fund partners for five years for BBC Television’s premier current affairs show, Newsnight. 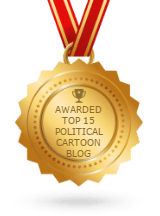 Palast is the author of the recently released New York Times bestseller, “Billionaires & Ballot Bandits: How to Steal An Election in 9 Easy Steps” from which some of the events for the Nation exposé are taken.